The modern business strategies are data-driven. Data plays a crucial role in empowering businesses to make decisions based on numbers, trends, and facts. The real challenge is to sift through the noise and get the right data at the right time in order to make the best business decision, and often to meet regulatory requirements. Salesforce customers often find it difficult to manage their Salesforce data growth as the data storage space is limited and additional storage space costs hefty. An efficient data archival strategy could be the best answer to this age-old challenge. In our previous webinar, we had a great session discussing various aspects to consider while creating a successful data archival strategy for your Salesforce Org. 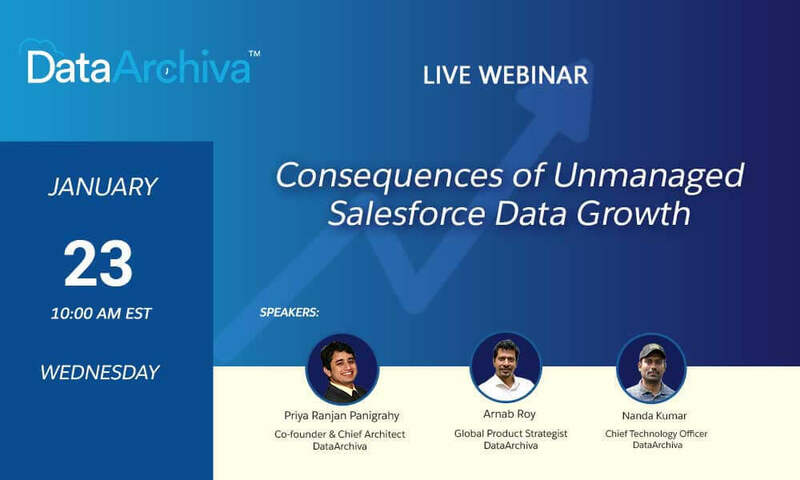 In the upcoming webinar, we will help you understand what are the potential consequences of unmanaged Salesforce data growth and how can you manage this effectively by leveraging the right approach and tool. Are you witnessing a rapid Salesforce data growth? Are you aware of what could be the consequences of this data growth? Do you know how to manage this Salesforce data growth? If you are looking for answers to these questions, you don’t want to miss this webinar. We are going to talk on a few of the key points on various Salesforce data growth related topics like Salesforce data growth sources, unmanaged Salesforce data growth, various consequences if not managed, most effective approaches to manage Salesforce data growth, why to archive and not backup, how DataArchiva is making Salesforce data archiving easy and cost-effective, and what the future holds for data archiving.